Our Lockable Window Restrictor range is designed with child safety and home security in mind. According to RoSPA (the Royal Society for the Prevention of Accidents) 4,000 children under the age of 15 are injured from unsecured windows each year in the UK, with 2,000 of these accidents involving children under 5 years old! 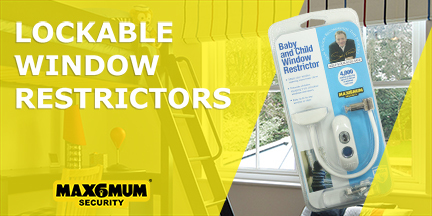 There is a very simple, affordable and effective solution – the MAX6MUM SECURITY lockable window restrictor. By restricting the window opening you can ensure the security of your home and safety of those inside. 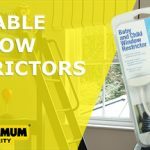 A 20cm long cable restricts the opening of the window to under 100mm, which not only prevents children from being able to fit through the gap, but it’s also wide enough to allow air to circulate around a room! Plus.. this gap is also too small for anyone to get in through the window – improving the overall security of a building. The window restrictor cable is locked into place with a key so that, should it be required, the window or door can be fully opened. This is simply done with a half-turn of the key. One of the most impressive features of our lockable window restrictors is the strength of the cable, which itself is made of hardened steel, making it extremely difficult to cut. 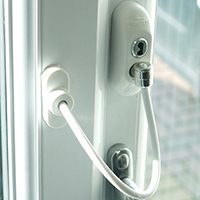 Max6 Lockable Window Restrictors are ideal for all types of windows and doors including uPVC, aluminium, wooden and metal profiles. With a step-by-step instruction guide, you can easily fit the window restrictor in just a couple of minutes.